Do You Wanna Build a Snowman(-like Ornament)? 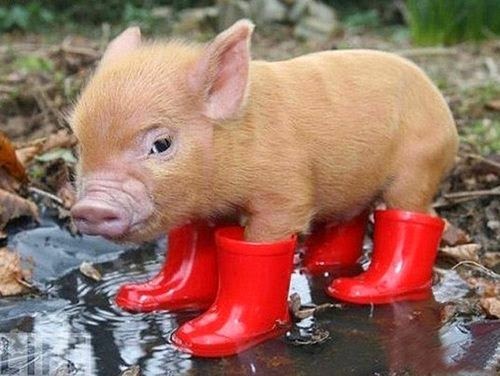 And I pin pictures like this ... because PIGLETS IN BOOTS!!!!! I don't do the whole Elf on the Shelf thing, either. It's because a.) I would inevitably forget to move the elf, and b.) I've got enough to deal with - like Turds on the Floor (thanks, dog) - without having to figure out creative ways for the elf to make mischief (and then cleaning it up afterward). Because, like ... if I wanted snow angels on the counter made out of flour I'm sure all I'd have to do is leave the canister within easy reach of my two-year-old. No creepy elf necessary! But I suppose I'm not totally devoid of motherly craftiness and holiday spirit, because I agreed to help the Kindergartners at my sons' school with a cute little snowman ornament craft. 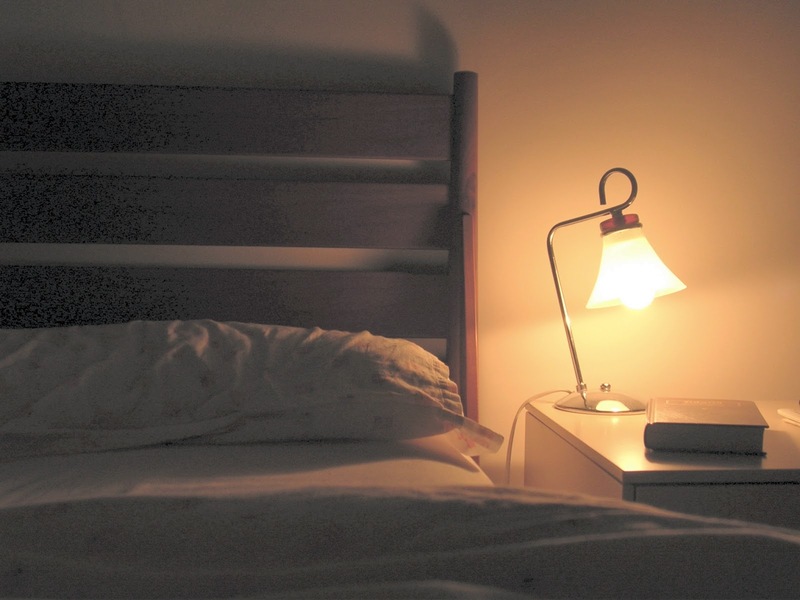 It's actually REALLY adorable, and fairly easy. ... Unless you're doing it with like sixty Kindergartners. It's pretty straightforward. 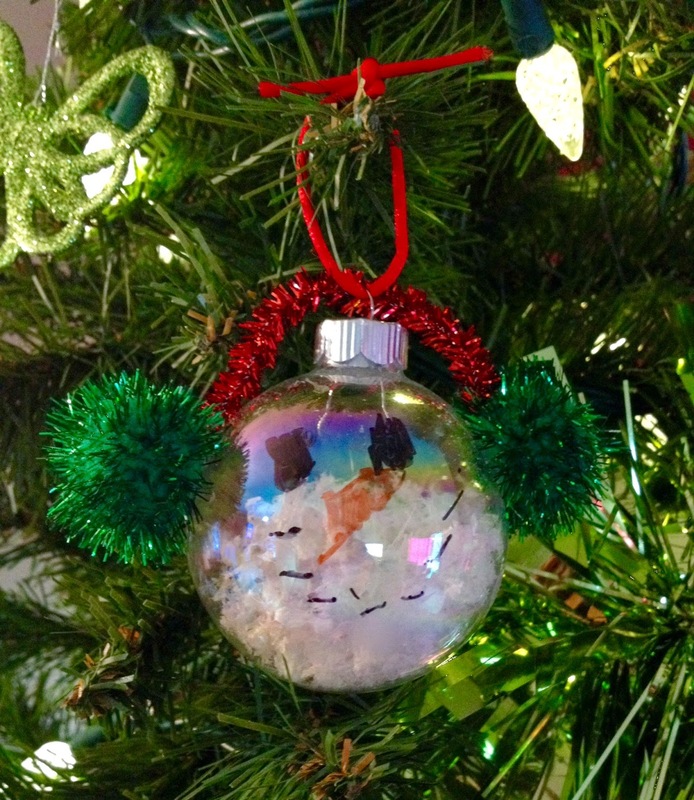 You fill a clear ornament with fake snow, have the kids draw a snowman face using black and orange Sharpies, and hot-glue the earmuffs on in the form of two sparkly pom-poms and a pipe cleaner. Voila! There's a tutorial here (and a picture of an ornament NOT made by a five-year-old). I helped out last year, and the kids had fun with it, and nobody glued themselves to anything. So there's that. 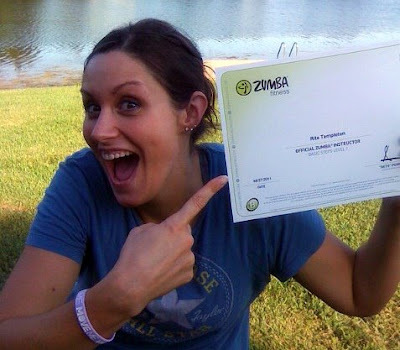 This year, my son's teacher asked me if I could help again. She asked me this while I was standing in subzero temperatures with chattering teeth, so all I could do was stammer out "S-s-s-sure!" (well played, Mrs. L.). But this year it wasn't only her class doing the craft ... it was all three Kindergarten classes. And last year, we had a little difficulty shoving the fake snowflakes through the funnel-hole, so this year she decided to use tiny little styrofoam beads from the inside of an old beanbag. Do you know how badly tiny little styrofoam beads cling to EVERYTHING? Your hair, your hands, your clothes, your shoes, the carpet, the table, and especially to a Kindergartner's entire arm up to the armpit when they decide to sink it into the open beanbag while you're hot-gluing someone's earmuffs on? For the most part, it went okay - it was just a lengthy process. Because if you've ever hung out with a five- or six-year-old you know that they like to talk. A lot. And they want to argue about why there are only black and orange markers available when theeeeey want their snowman to have bluuuuuue eyes. And they want to look at what their friends are doing and poke them with pipe cleaners and tattle because someone is poking them with pipe cleaners. And they want to know why they shouldn't write their name so big on the back that it wraps all the way around the front to cover the snowman's face. It took over three hours to get all three classes' ornaments put together. That's a lot of tiny styrofoam beads, y'all. And a lot of patience (which I'm pretty much lacking to begin with). Seriously, I think I used up my patience reserve through about 2017. But the kids had a lot of fun and were proud of the finished product, and they got to hang them on the school Christmas tree. And I missed lunch and spent at least an hour and a half in a squatting position, which probably counts as a workout, right? Just think, your Grandma Collier taught Kindergarten for many, many years and loved it! I admire that kind of patience.....which you and I obviously didn't inherit! I don't have a lot of patience either. It's probably why I don't volunteer at school as much as I should. Cute ornament though! Love this ornament - super cute!